MACON, Ga. - Georgia Farm Bureau (GFB) voting delegates elected the organization’s 2018 board of directors Dec. 5 during the 80th Annual GFB Convention held on Jekyll Island. GFB President Gerald Long continues to serve the two-year term GFB members elected him to last December. Long, of Bainbridge, raises cattle and grows peanuts, vegetables, corn, cotton, hay, small grains and timber with his family on their farm near Bainbridge. He has served on the GFB Board of Directors in various roles since 1999 and is a Decatur County Farm Bureau director. In addition to his Farm Bureau leadership, Long is a member of the Georgia Cattlemen’s Association and is a past treasurer of the Georgia Beef Board. 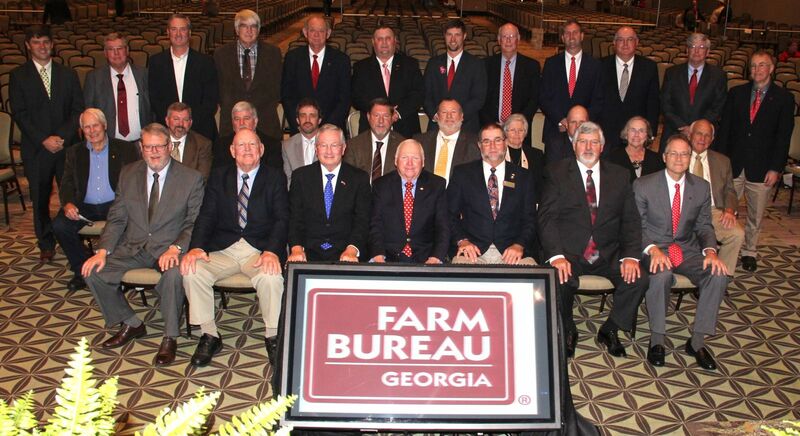 GFB members in the organization’s North Georgia Region re-elected Bernard Sims of Catoosa County to represent their region on the Georgia Farm Bureau Board of Directors for his fourth, three-year term. The GFB North Georgia Region is comprised of 49 counties in the upper third of Georgia. Sims, who ran unopposed, serves as the Catoosa County Farm Bureau president, and grows turf grass, small grains, strawberries and hay and raises cattle. GFB membership is open to the public and offers a wide variety of benefits, including insurance and discounts for health services, travel and family entertainment. Enrollment in any of the member benefits is optional and not a requirement for membership. If you would like more information about agriculture, please visit www.gfb.org, like Georgia Farm Bureau on Facebook or follow GFB on Twitter.